Whilst much has been written about the doors that technology can open for students, less has been said about its impact on teachers and professors. Although technology undoubtedly brings with it huge opportunities within higher education, there is also the fear that it will have a negative effect both on faculty and on teaching standards. Education Is Not an App offers a bold and provocative analysis of the economic context within which educational technology is being implemented, not least the financial problems currently facing higher education institutions around the world. 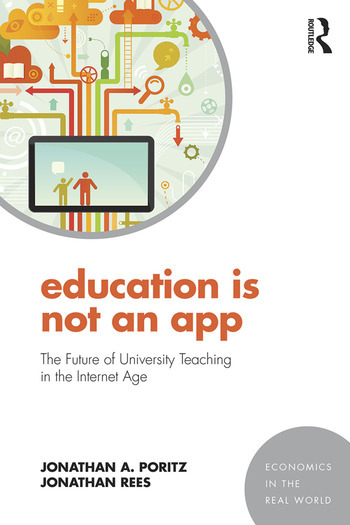 The book emphasizes the issue of control as being a key factor in whether educational technology is used for good purposes or bad purposes, arguing that technology has great potential if placed in caring hands. Whilst it is a guide to the newest developments in education technology, it is also a book for those faculty, technology professionals, and higher education policy-makers who want to understand the economic and pedagogical impact of technology on professors and students. It advocates a path into the future based on faculty autonomy, shared governance, and concentration on the university’s traditional role of promoting the common good. Offering the first critical, in-depth assessment of the political economy of education technology, this book will serve as an invaluable guide to concerned faculty, as well as to anyone with an interest in the future of higher education. Jonathan A. Poritz is Associate Professor of Mathematics at Colorado State University-Pueblo, USA. Jonathan Rees is Professor of History at Colorado State University-Pueblo, USA.